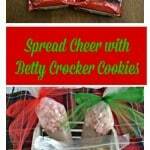 Today is Day 10 of The 12 Days of Christmas here at Hezzi-D’s Books and Cooks. Today I want to focus on giving to others. While getting gifts is a lot of fun, sometimes the most fun is giving a gift to someone who isn’t expecting it. I really like to think of a few people who have done a lot for me without expecting anything in return and give them something special. It doesn’t have to be expensive, just something to show how much I appreciate them. Think of it as Give Extra, Get Extra. These people give me extra time and extra help so in return it’s time they get something extra. This holiday there is one VIP that I need to give something back too. My school secretary, Kim Miller, is an incredible person. Some may say she runs the school and I agree. For the last 2 years our school principal has been in and out on medical leave and we’ve had a series of different interim principals to fill in for her. During this time the school would have been in total chaos if not for Kim. Kim keeps track of everyone from the kids, to the teachers, to the principal. She knows everyone’s schedule and where they need to be. She helped each and every interim principal create a schedule, showed them where everything is, and basically helped with every aspect of keeping our school running. If I don’t know why a kid has been out sick for a few days all I need to do is ask and Kim has already called home and has the answer. When my printer runs out of toner and I’m in the middle of printing an IEP I run up to the office in a panic only to find that Kim ordered an extra toner cartridge last time so I would have it whenever I ran out. If a student comes in late and needs to eat breakfast I don’t have to hunt them down, Kim calls and lets me know they are at school. Whenever I have a student that can’t handle sitting in the classroom just one minute longer I send them up to the office and without even knowing why the child is there Kim gives them a job to do to keep them occupied and then sends them back to class with a smile on their face. Kim is certainly a VIP in my school that makes not only my life easier, but the lives of everyone who works there easier as well. So this holiday I decided to give Kim a little extra with the help of Extra Gum. I bought several packages of Extra Gum to make a statement on the gift basket I as giving to Kim. 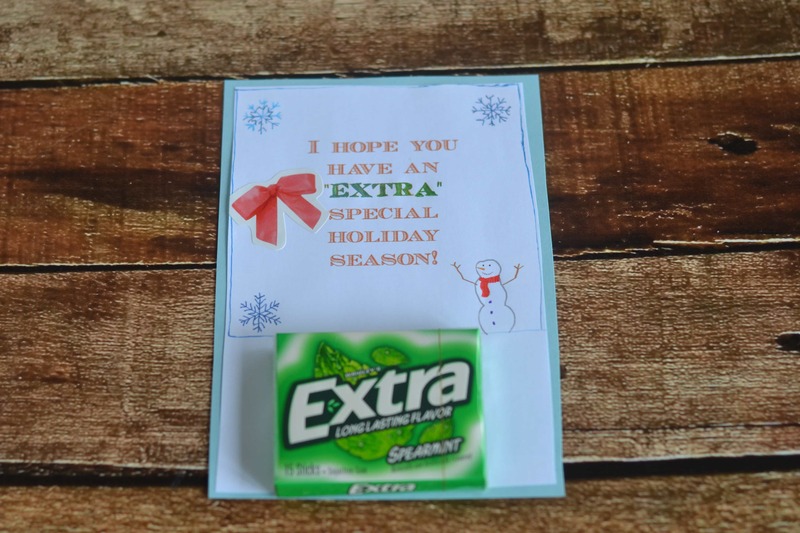 I created a little tag saying, “I hope you have an “Extra” special holiday season” and attached the Extra gum to the bottom of it. Since Kim is so crafty I pasted it onto a piece of card stock to give it a colorful border, drew on a few snowflakes with gel pens, and put a few festive stickers on the tag. 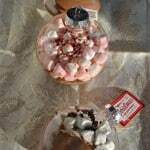 Then I thought about things that Kim would enjoy and started filling up a gift basket. The first thing I put in was a box of coffee. Kim is always at work early in the morning and needs her morning cup of coffee to keep her energized throughout the day. Since I know that one of her favorite hobbies is scrapbooking I put in a package of scrapbook paper, some stickers, and a package of cards. Then I filled up the basket with office supplies like sticky notes, paper clips, rubber bands, and pens that she always needs. I finished the basket off with two homemade jams and a few more packages of Extra Gum just to let her know she’s “Extra” special and I appreciate her. 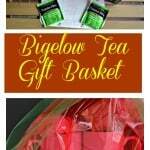 I placed the gift basket on her desk early Tuesday morning. When I came up to sign in that morning Kim had a huge smile on her face. She asked if I left the gift basket and when I told her I had, she told me she loved it but I didn’t have to do that. She was just doing her job. I promptly told her that she always gives a little extra and I was happy to give her a little extra in return. Kim was thrilled with her gift basket and started telling me all the things she loved that were in it. I’m so glad I could brighten up her day by giving her a little “Extra” this holiday season. The next day when I walked in Kim left something “Extra” for me in my mailbox. It was this adorable handmade thank you card. Isn’t she creative? 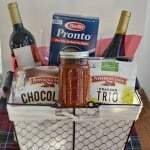 I would be very happy to receive a gift basket filled with all this cool stuff! 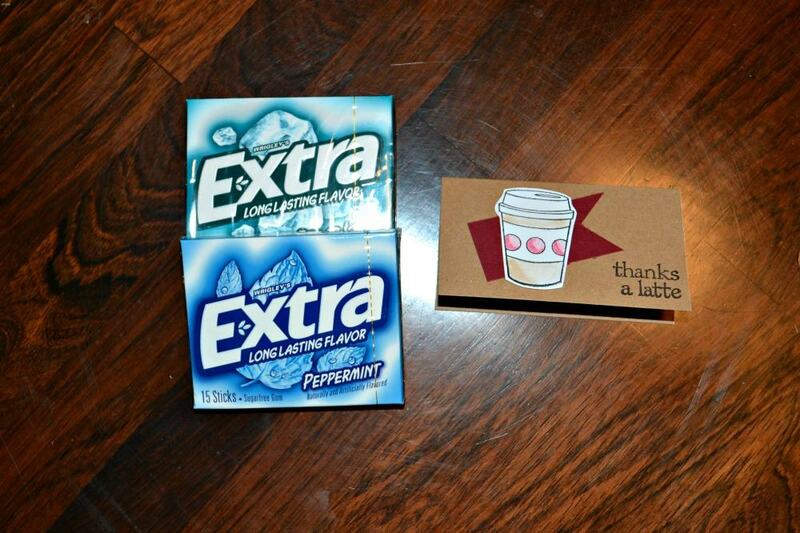 You can never go wrong with coffee or gum when it comes to gifting and Extra does have the longest lasting taste. I have always loved Extra Gum. 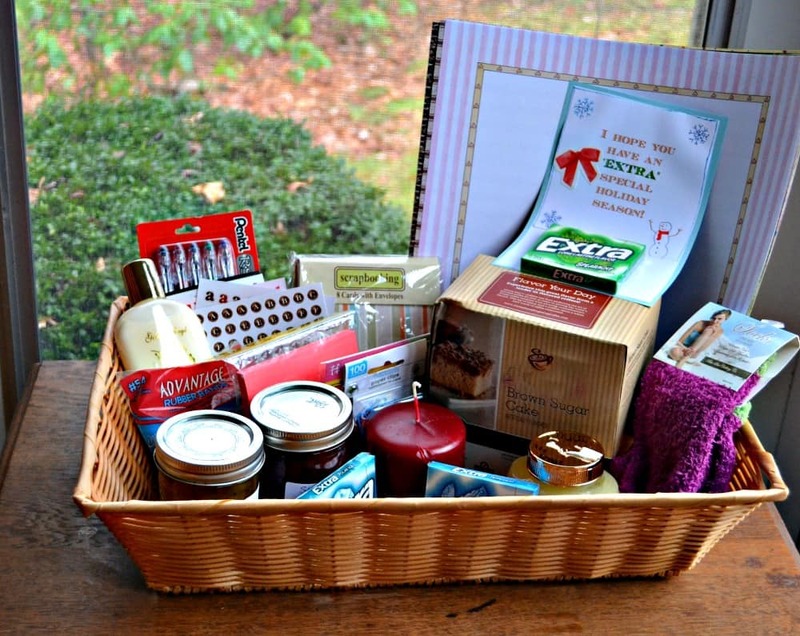 Such a cute gift basket! What a great idea to put extra stuff in it with the extra gum. Her card was very creative too. Thanks! She was so excited to receive it. This would make a really cute basket indeed. I love Extra Gum and chew it all the time so do my kids. Thanks for sharing. Our school secretary is awesome too. We had an ornament made special for her this year. I love the basket you had made for your Ms. Kim! Thank you! If anyone deserves it, its her! So true that we need to acknowledge those special people in our lives. Sometimes, the ones who help us most are often forgotten. What a wonderful thing you did to make her feel appreciated, and a great reminder for her to take some time for herself! I agree! She does so much for us it was a nice way for me to give back to her! You are such a great gift giver! And I have to say, secretaries really do a lot!! They deserve such a great gift. Kim sounds like a wonderful individual. She’s awesome. I don’t know what we’d do without her!